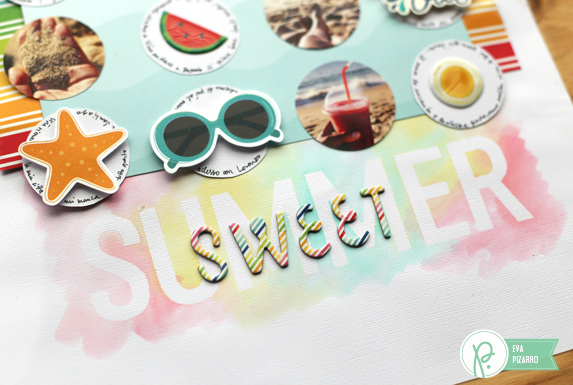 July 2015 - Pebbles, Inc.
Hi, Renee here today to share a step-by-step tutorial on how I made these summer-themed banner shaped birthday cards using the Fun In The Sun collection and the We R Memory Keepers Banner Punch Board. So quick to make! I also kept the designs simple so that each banner shaped card can fit into any 4″ x 5.5″ envelope and not require extra postage if you mail them. 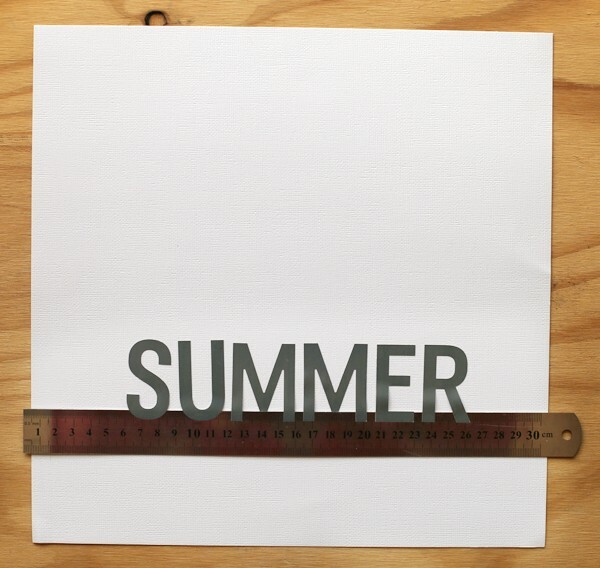 I started by trimming the cardstocks down to 4″ x 5.5″ (folded size). 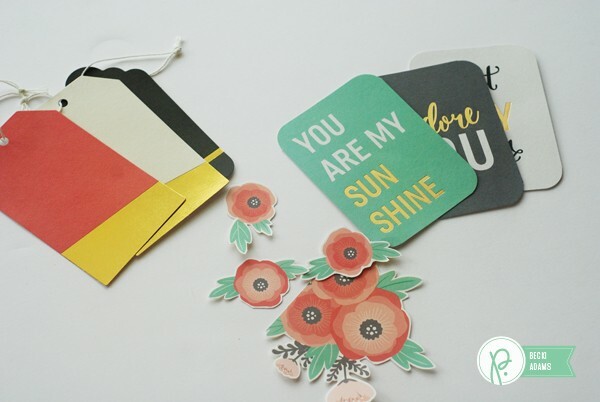 I used the We R Memory Keepers Banner Punch Board to create Flags. 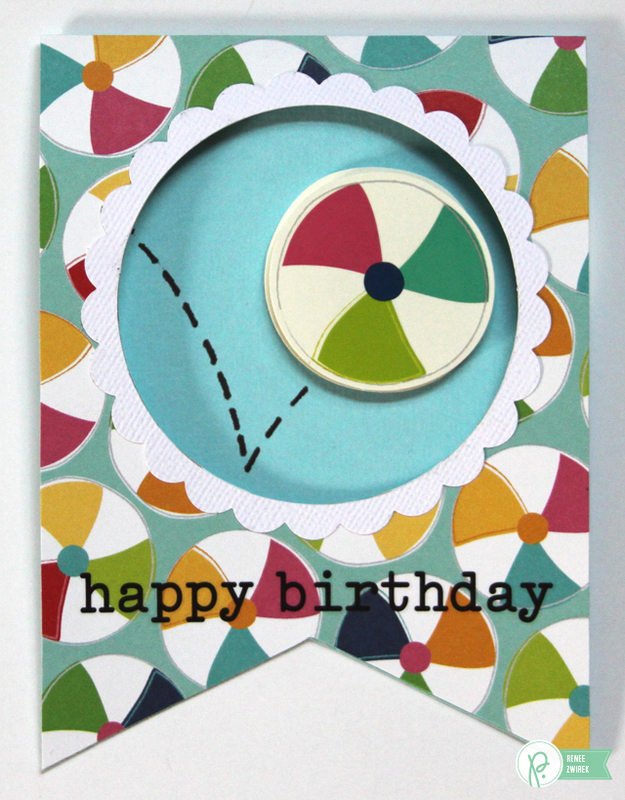 I used this circle shape template and this shape cutter tool to create windows in each card. 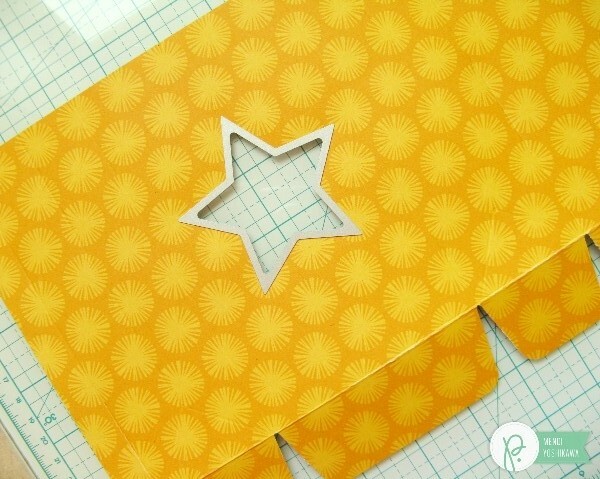 I adhered my pattern papers to each card making sure I cut the windows out first. and adhered it to each card. 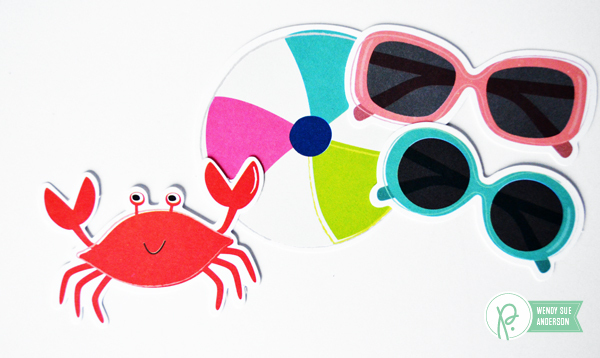 I also added an adorable Layered Sticker to each card. 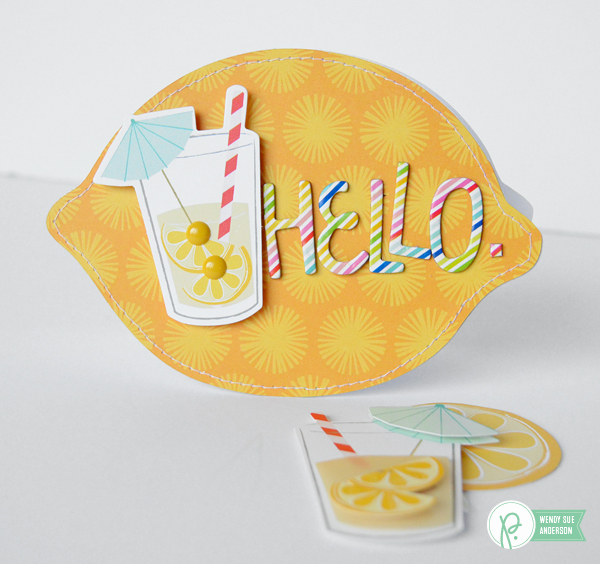 They look so cute showing through the card window! 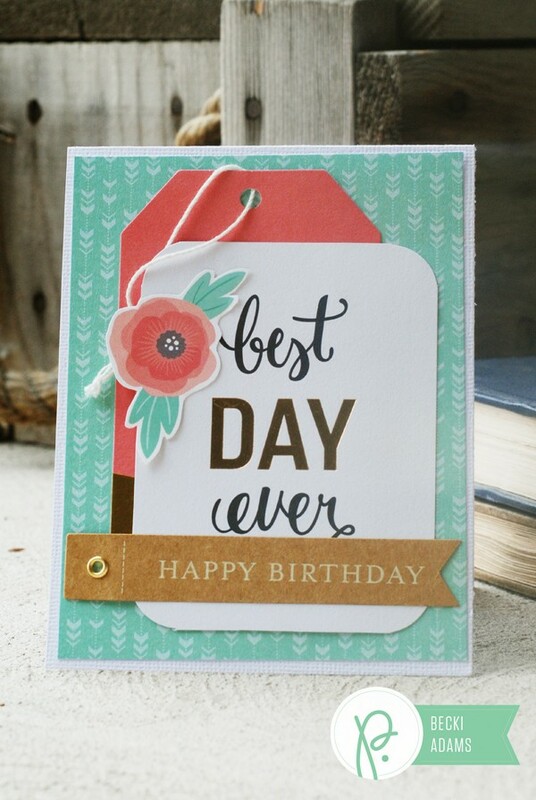 For a final touch, I added a Happy Birthday Rub-On to the front of each card. 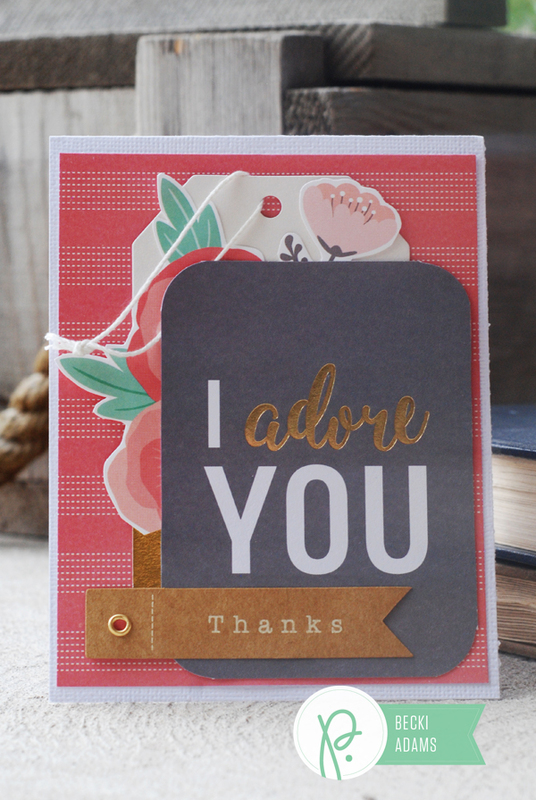 I used the From Me to You Roller Stamp to add a short but sweet message inside each card. Hi there Pebbles friends! 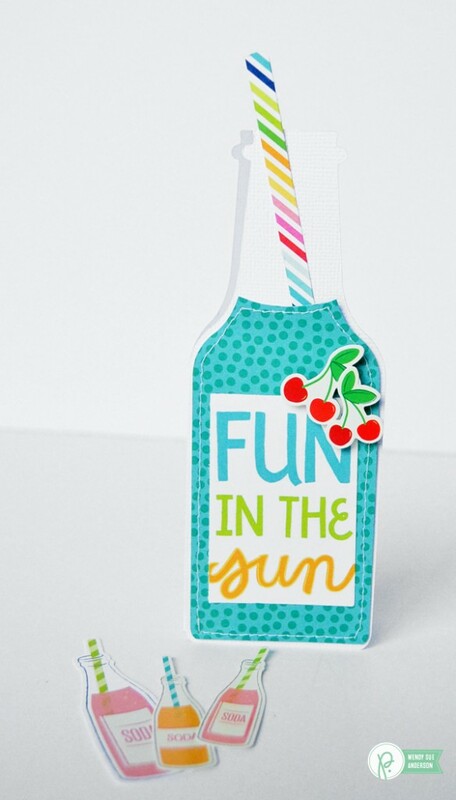 It’s Wendy Sue here today, sharing a fun set of summer cards I created with the “Fun in the Sun” collection! 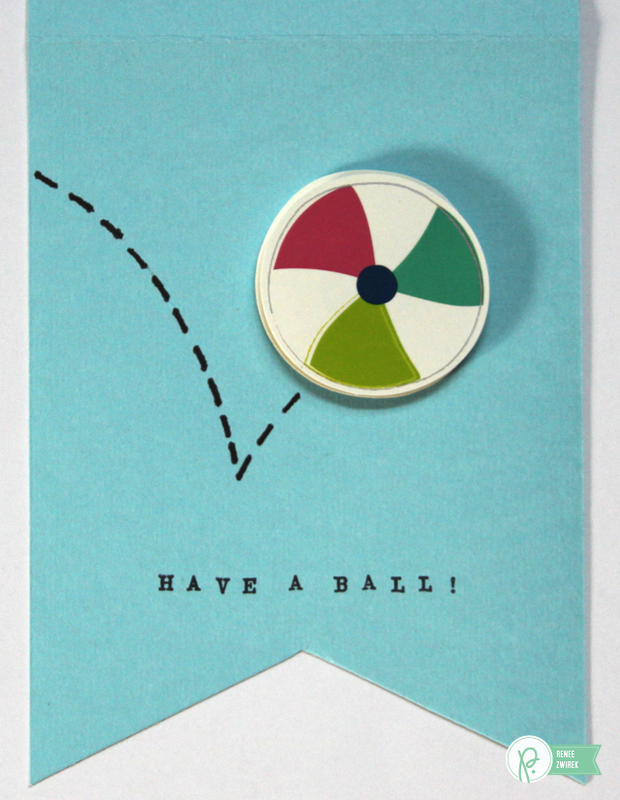 Sometimes I like to step out of box, or the rectangle, and create cards in fun and interesting shapes. 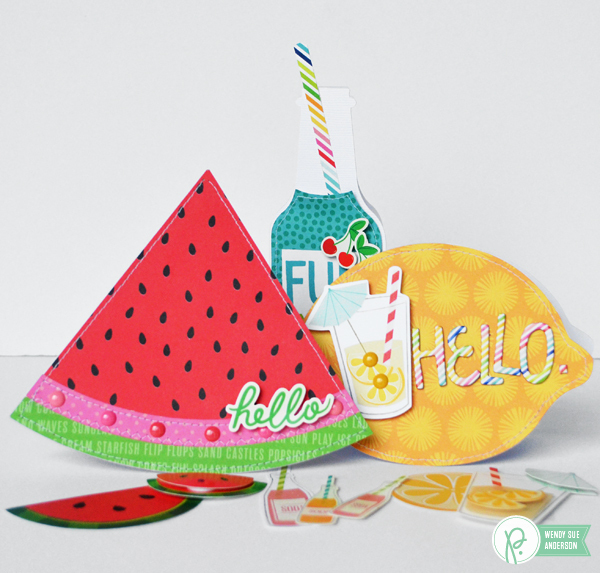 As I was looking through the fun designs in this collection, looking for inspiration, I started thinking about how fun it would be to create cards based on the shapes of some of the embellishments. 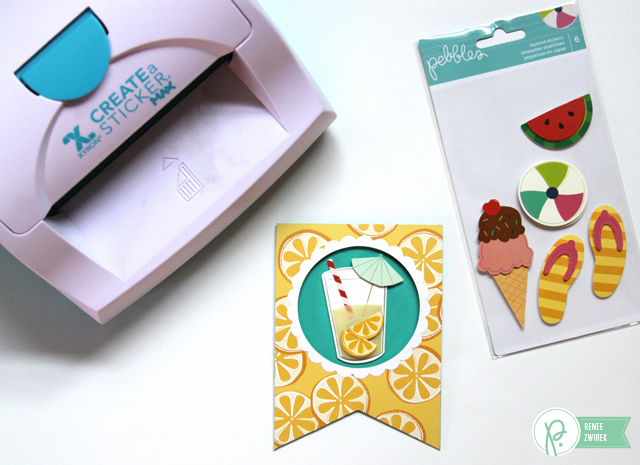 I pulled up the Silhouette Design Store and started hunting for shapes that coordinated with the chips, stickers, and other elements. Here’s what I came up with! 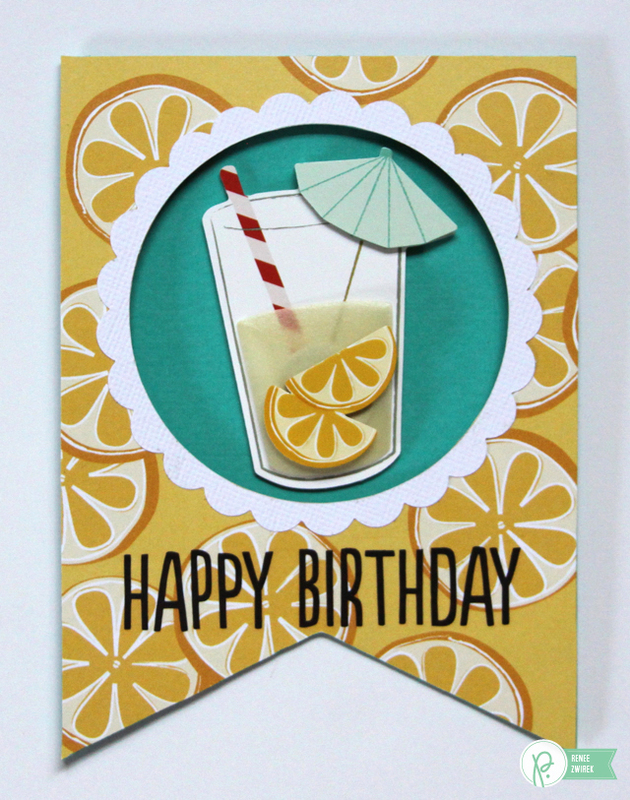 This isn’t the very first card I created…but I think it’s my favorite! I simply purchased a lemon shape from the Silhouette store, then copied it and welded the two together. After I cut it out of white cardstock I was able to fold it in half for my card base. 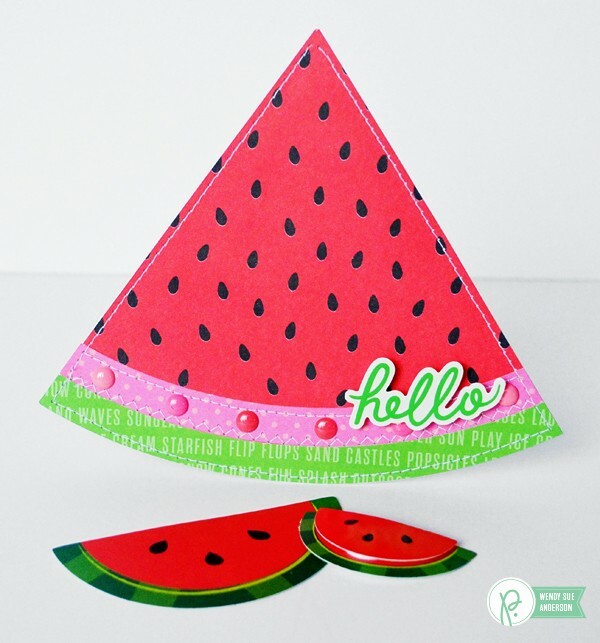 I cut a second shape from patterned paper, stitched around the edges with white thread, and attached it to my card front. Finally, I pulled out some embellishments from the collection and went to town! The watermelons in the collection were all half-slices, but I thought the quarter slice shape was fun for a card. I followed the same process as above – except I cut several pieces and then layered them together to make the melon and rind. 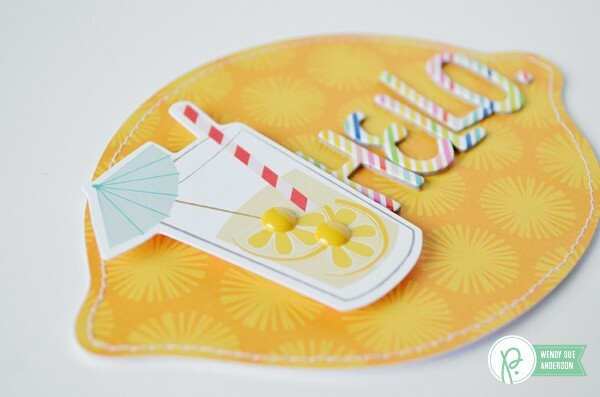 Finally, I wanted to create a card shaped like a soda pop bottle – I think the straw (which I made from the tear strip on one of the papers) is my favorite part of this one! So, that’s it! It’s fun to look at a collection with a little bit of a different perspective, thinking of the basic outlines and shapes, thinking of which ones could make fun shaped cards. 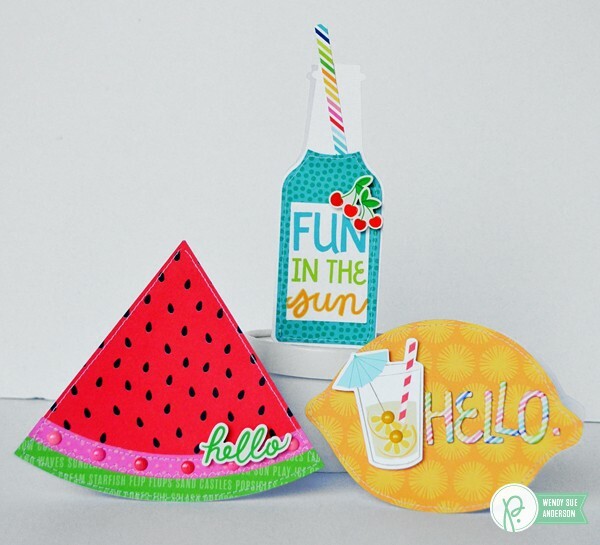 Now I’d like to challenge YOU to create some fun shaped cards – please leave a link to your projects in the comment section so we can check them out! Now I think I’ll create a few more unique cards, using these as my inspiration! Hi there! 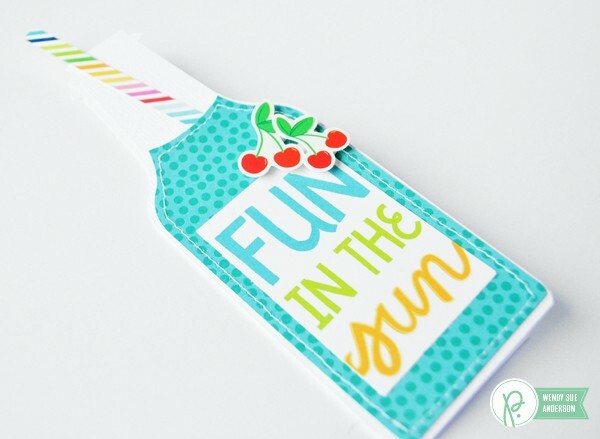 It’s Mendi here with some fun ideas for summer gift bags using Pebbles Fun In the Sun collection along with the new Fuse tool & Gift Bag Punch Board by We R Memory Keepers. 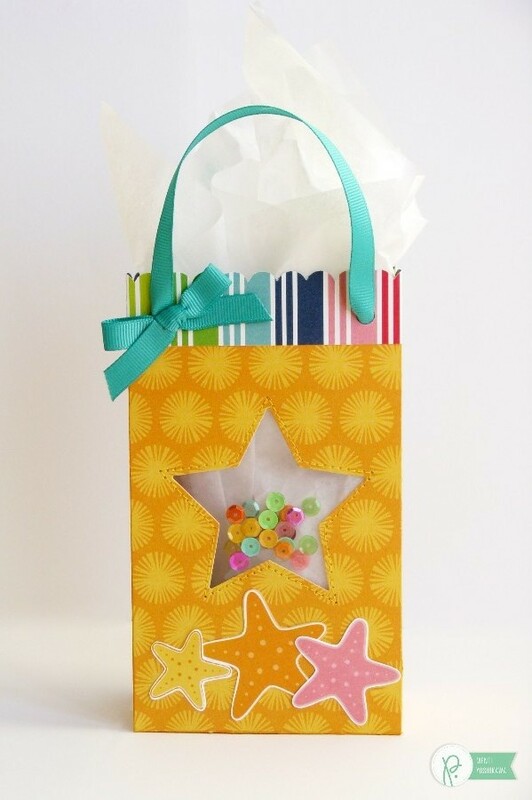 I don’t know about you, but I rarely think to prepare a fun gift bag on the actual day of an event so I love having some ready to go when I’m headed out the door to a special occasion. 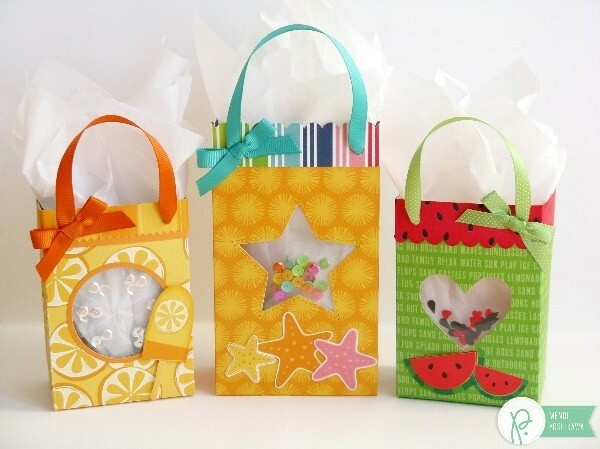 I thought it would be fun to experiment with different shapes of shaker windows for each of my bags. Up first I have a circle shaped shaker that I created. To achieve this I added all my sequins to the circle shape before closing it up. 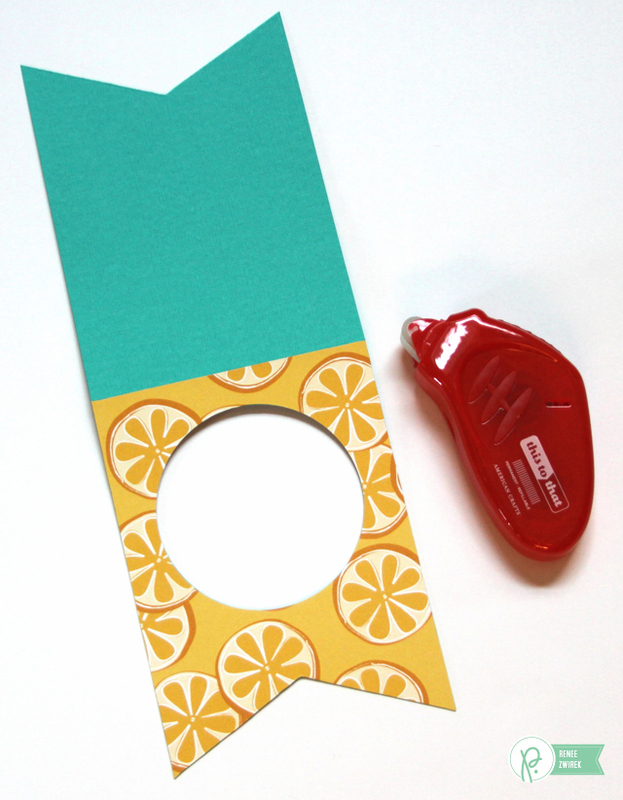 I then slid the sequins over to create citrus slices by using the little metal ruler that comes with the fuse tool. 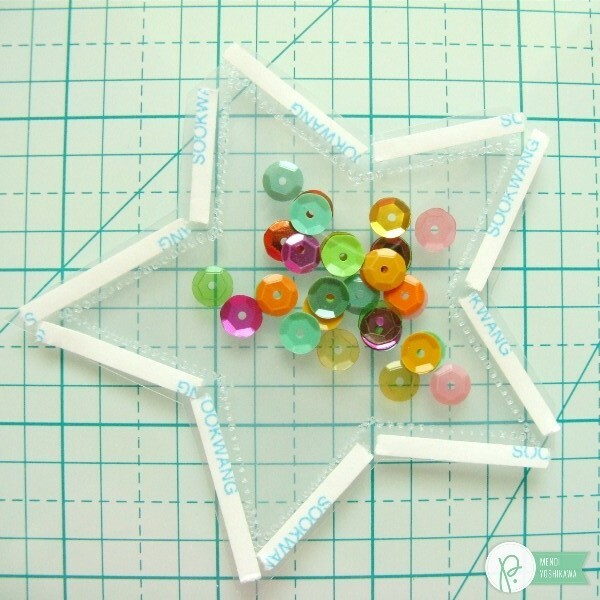 My next bag features a star window filled with multi-colored sequins. I cut an extra band of patterned paper to go along the top of my bag which I punched with a scalloped edge using a border punch. 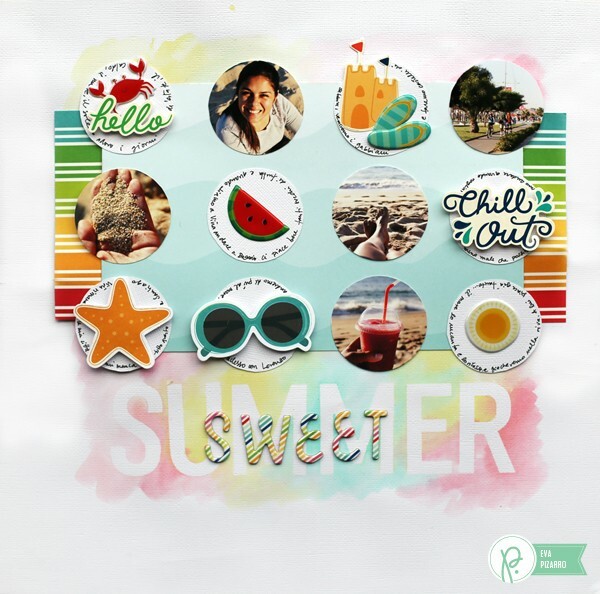 Make sure to keep reading because I share step-by-step instructions on how I created this fun window using the fuse tool. My last gift bag is my favorite. 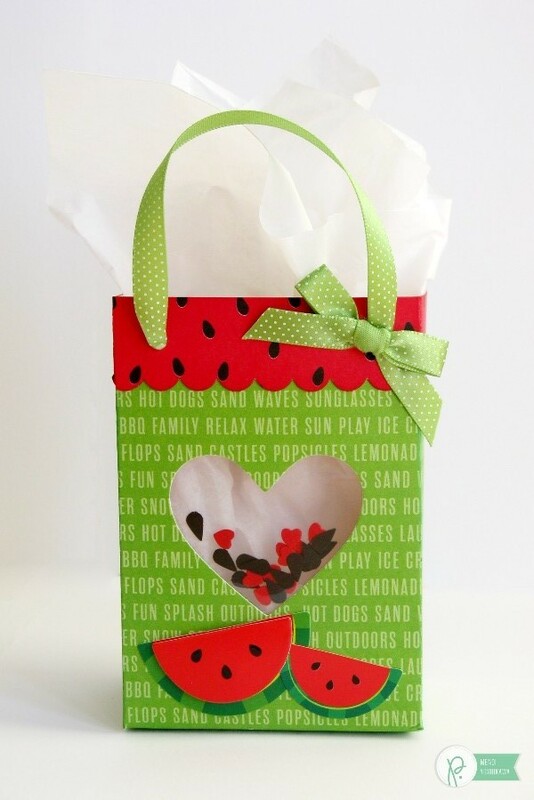 It uses some of the fun watermelon print papers from the collection so I thought it would be really fun to create a heart window and punch out little raindrops to pose as watermelon seeds for my shaker. 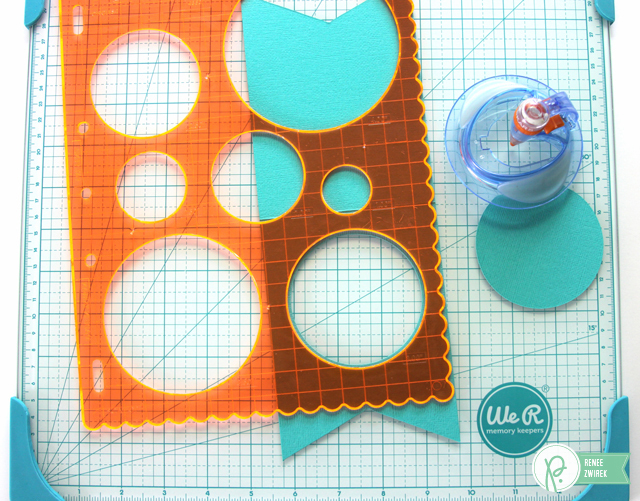 I was amazed at how easy it is to create these little windows with the fuse tool and some basic supplies I already had on hand! Using an old page protector I snipped off a small section just a wee bit larger than my die. 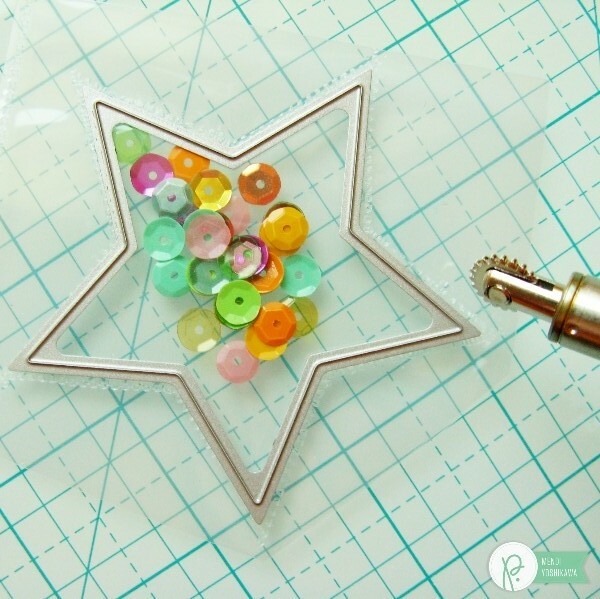 I then used the die as a template and traced it with the fuse tool, making sure to leave a small section open to slip my sequins and punches into. 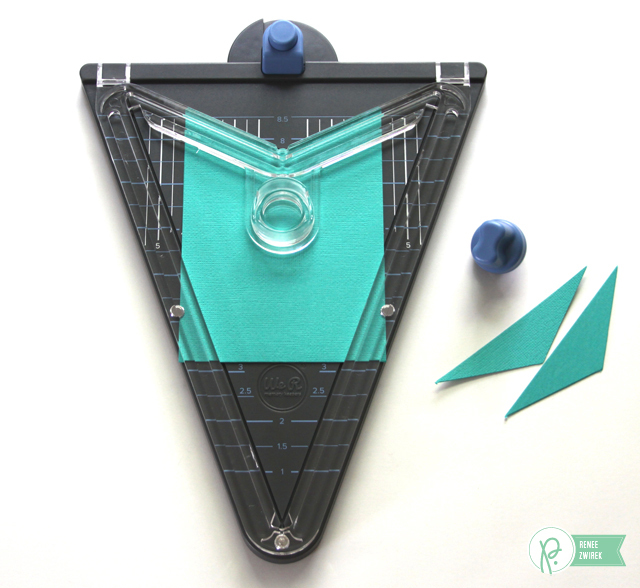 After filling up the little pouch, I re-positioned my die and fused the remaining two edges with the tool. 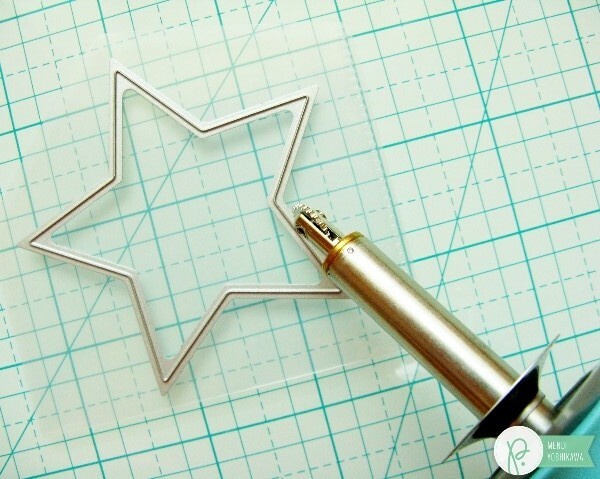 I then trimmed around the star leaving a small border around it and added sticky adhesive tape to the side that I wanted to face out on my bag. 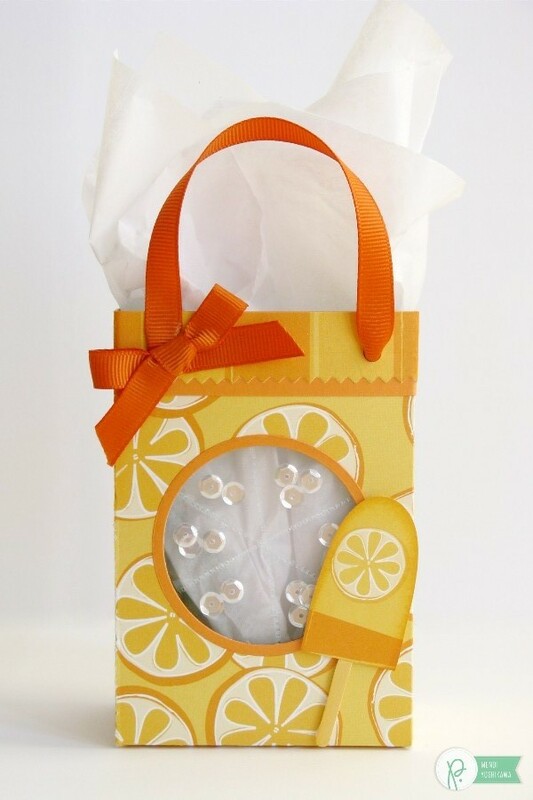 Using the same die I die-cut a window out of my gift bags. This was a bit tricky for my largest gift bag due to the width so I had to fold the bottom flaps under while running it through my diecutting machine. I then taped the fused star pouch to the inside of my bag. Using the same sized die works well for this technique since most dies have a slight border around them. Hello everyone! 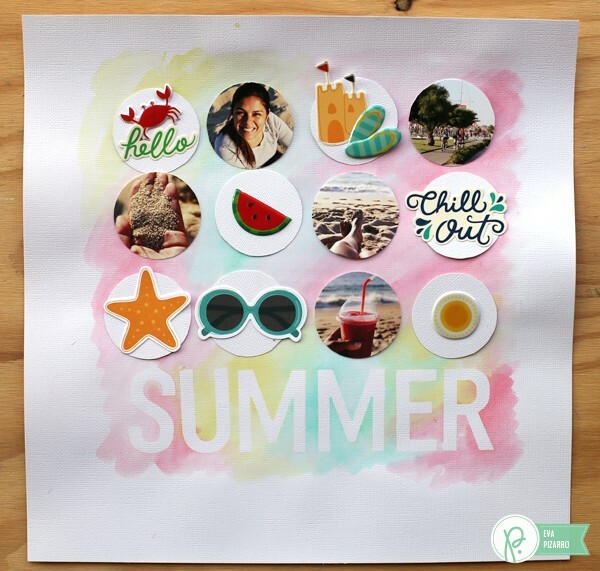 I’m Eva Pizarro and today I want to share with you a very cool technique using the alphabet masks from the Cottage Living collection. 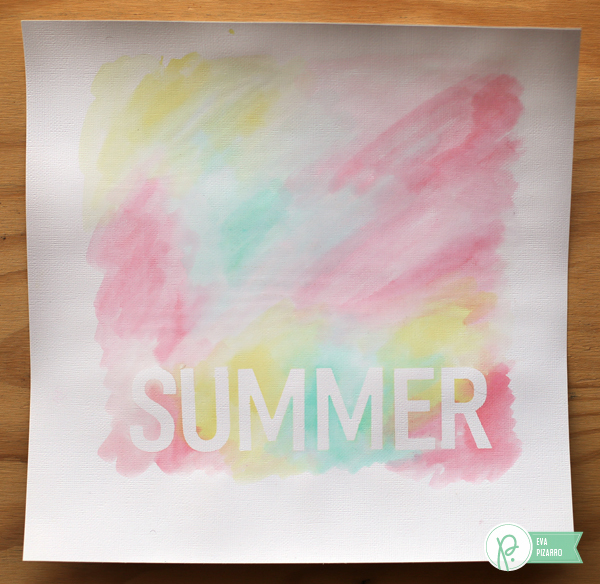 As soon a I saw these I knew I wanted to use watercolors to create a negative background. The alphabet is very easy to stick and peels off perfectly. It worked great for this kind of project! Start by positioning your title on your page. I usually use a ruler to make sure my letters are straight and centered. 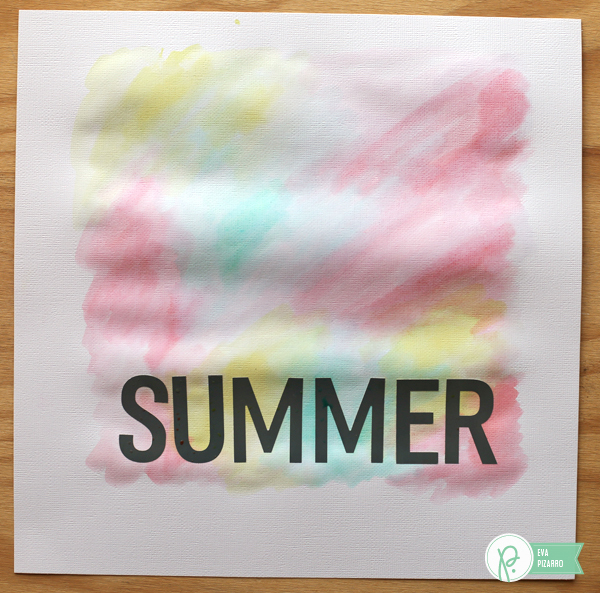 Use watercolors on your background over your alphabet masks. I am a beginner with watercolors so if I could do it, you absolutely can! Don’t use too much water or the paper will wrinkle. Wait untill it is dry and peel off the letters. To remove any wrinkles, turn your paper upside down and iron it with your regular iron on a lower setting. 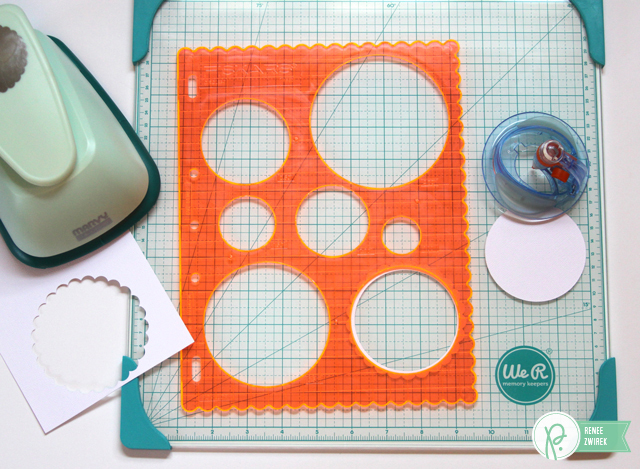 Cut circles from white cardstock and embellish them with stickers. 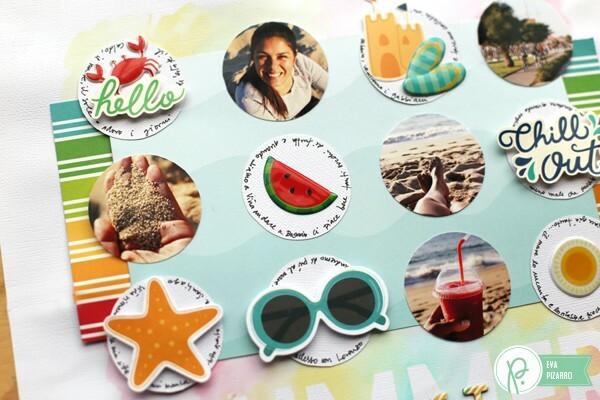 Add cut out circle photos. 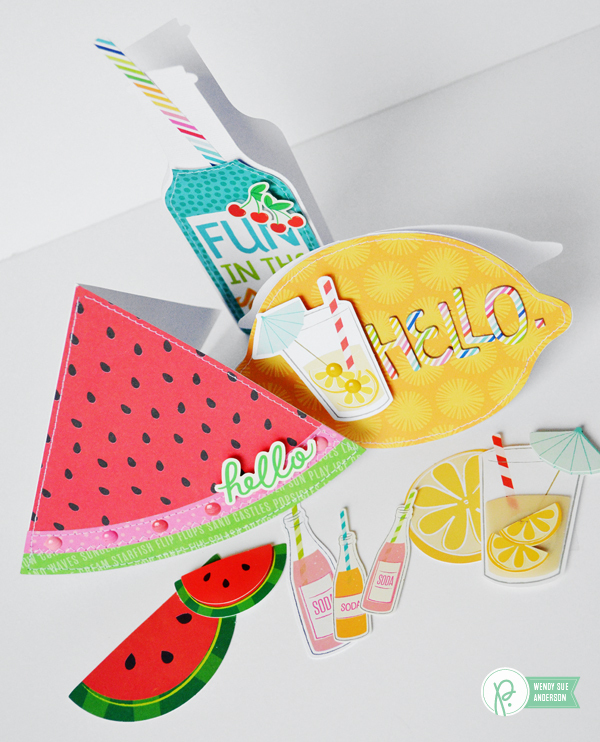 Finish your layout with some paper and journaling. I love how my title turned out! I also used the thickers alphabet on top, and I think it adds a nice touch! 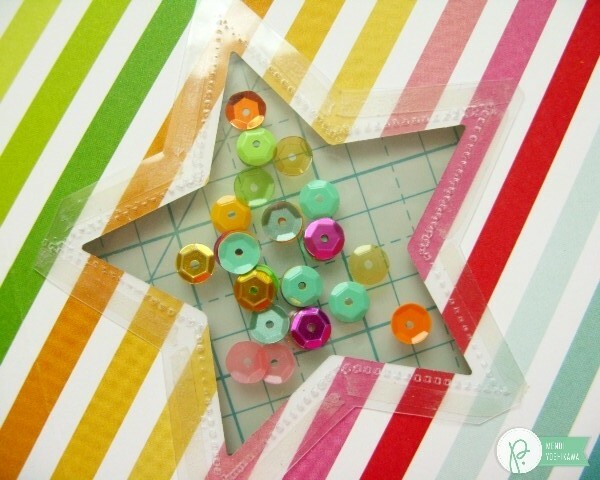 These little embellishments are so colorful and pretty! I used a combination of cardstock and puffy stickers and some chips. I also added some dimension with foam doats. The alphabet masks are very easy to use and the package contains so many letters that I know they will last a long time. Have a great day! 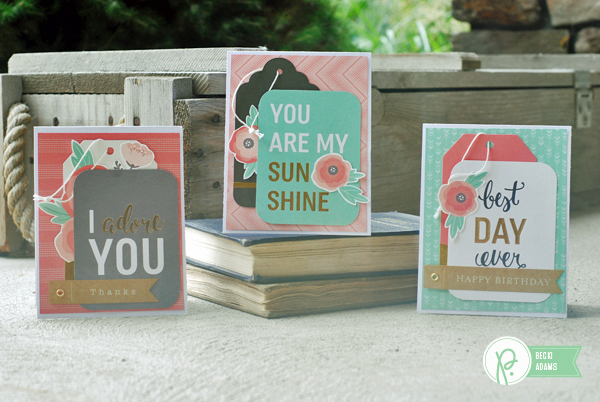 Hello friends, Becki here, to share with you 3 easy cards I created using the Cottage Living collection (and a little bit from the Home+Made collection). I used the gold foil 3×4 cards, some flowers that I fussy cut from patterned paper, and a tag to create these adorable cards. Did I mention they were easy? They really are easy and so much fun to create. 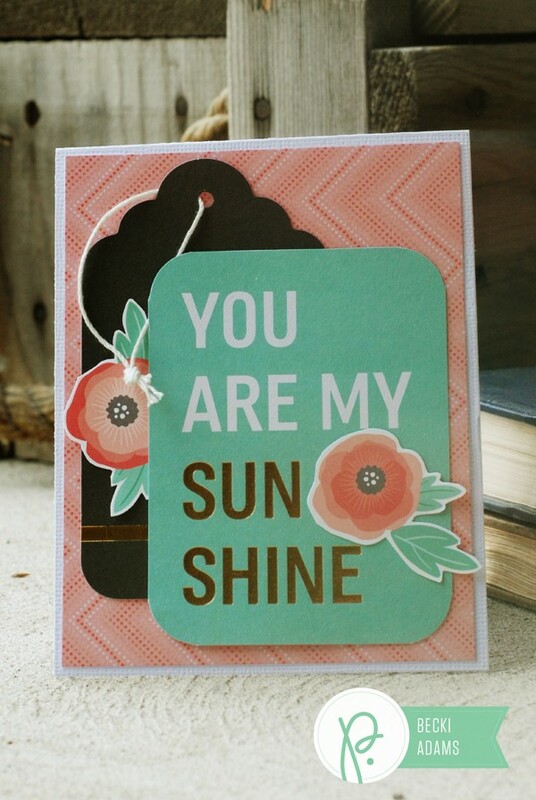 I love to have these types of cards in my greeting card drawer, ready to be put in the mail or attach to a gift. 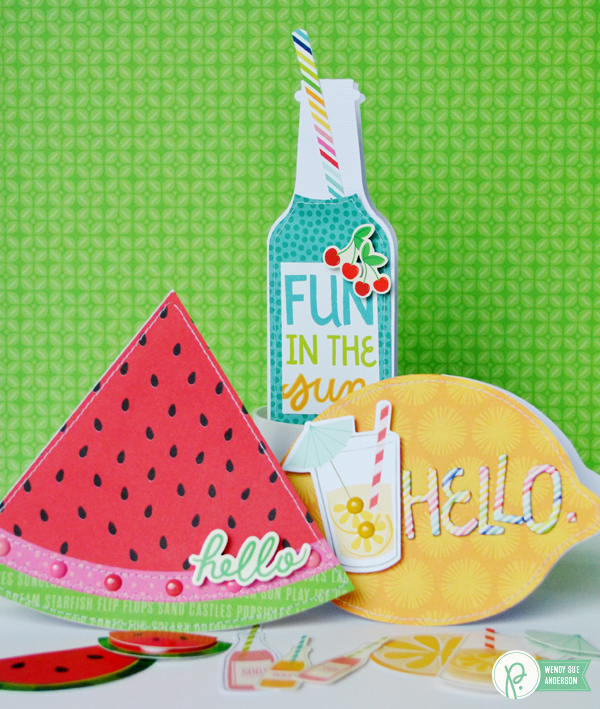 I used white cardstock and papers from the 6×6 Cottage Living paper pad to create the base for these cards. 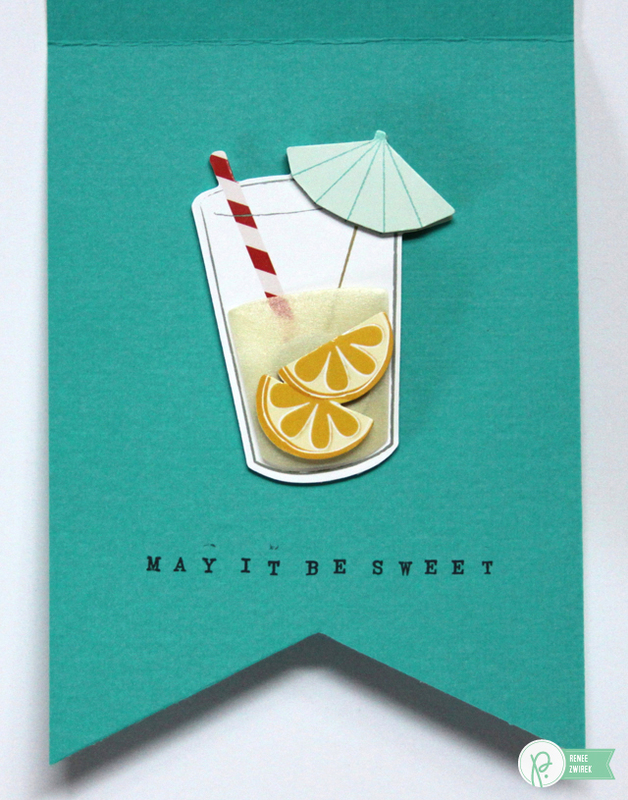 I added a little bit to the sentiments by adding a tag from the Home+Made collection. The tags added a bit more of a personal message to the cards. Each card has it’s own personal touch. 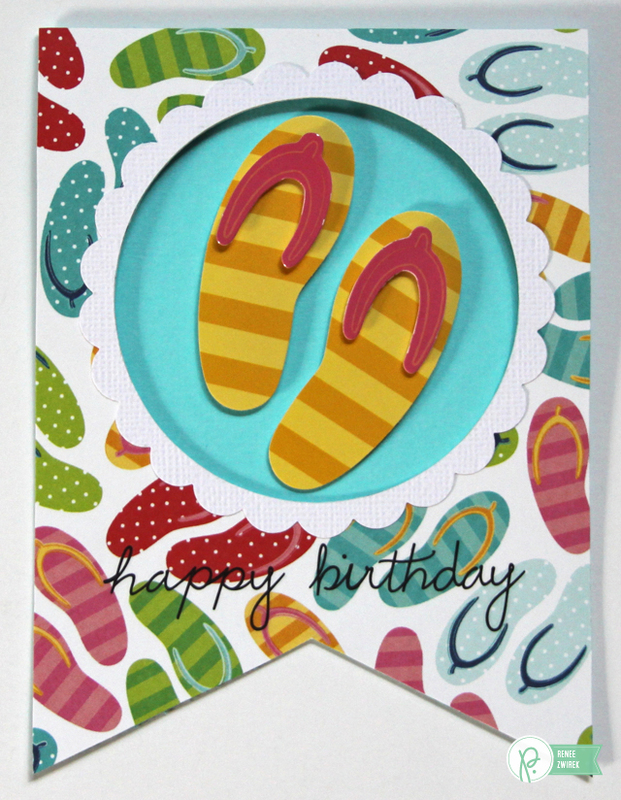 They were so easy to put together with all of the sentiments preprinted onto the 3×4 cards and the tags. 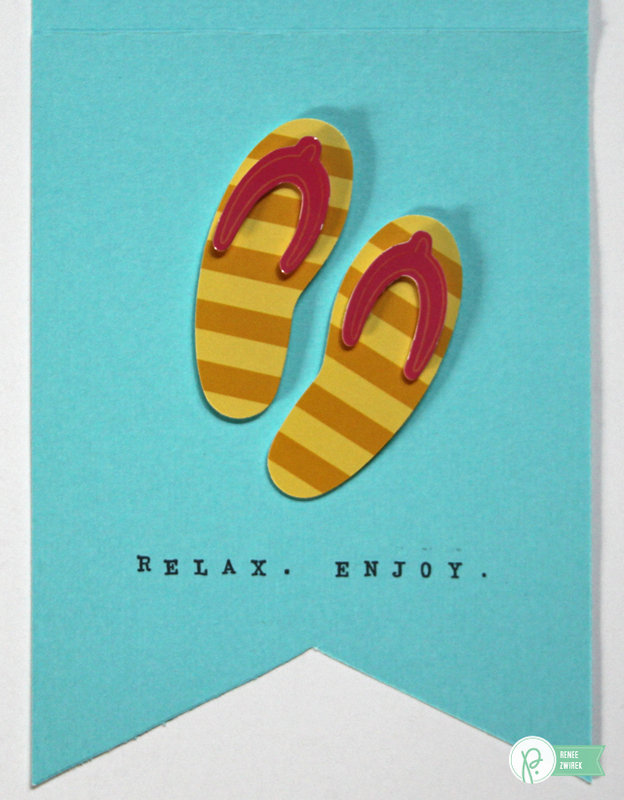 Next time you need to create a quick greeting card, try adding tags and 3×4 card for easy sentiments. Thanks for joining me on the Pebbles blog today! Have a great Friday.